274 km. 40.308 km/hr average speed. 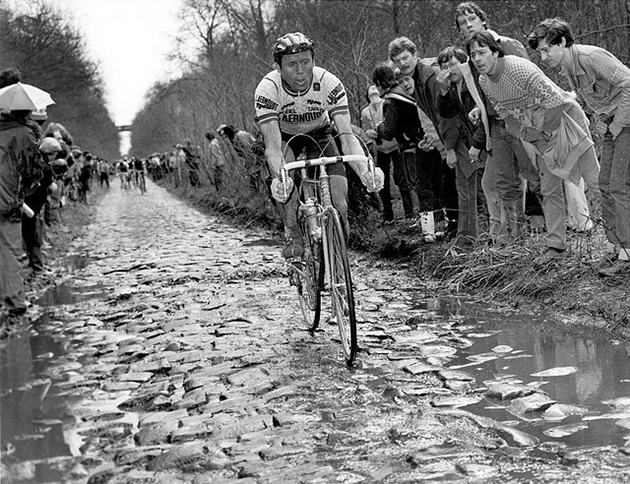 Winner Hennie Kuiper is being chased as he navigates the cobbles in the 1983 Paris-Roubaix. Kuiper's bad luck doesn't seem to end. He flats while on a solo break. 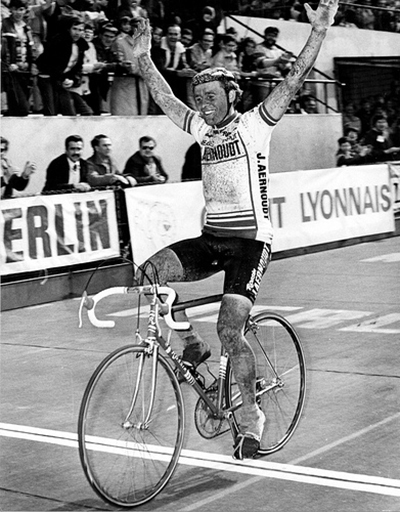 But Kuiper stays away to win the 1984 Paris Roubaix. 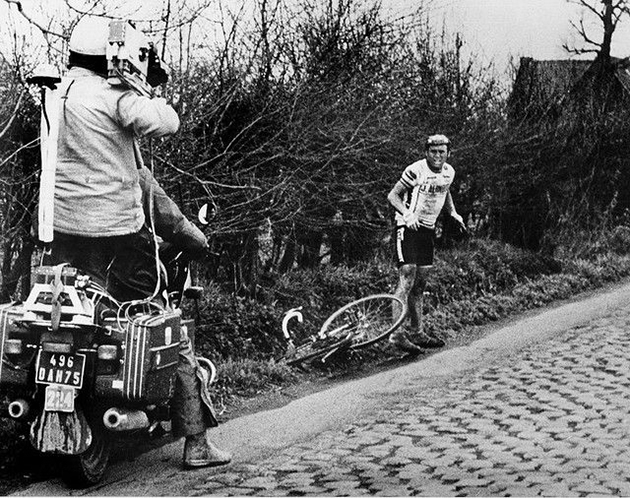 The Race: Francesco Moser, who had already won Paris-Roubaix three times, dropped the hammer on the Trouée d'Arenberg cobbles. That huge effort reduced the lead group to just five riders. Hennie Kuiper, who had already suffered two crashes, nevertheless managed to stay with the leaders. Kuiper knew he could not beat the others in a sprint, especially Francesco Moser. So Kuiper did what he did best, he took off on a solo break. Initially, no one chased and with sixteen kilometers to go he had a lead of a minute and a half. Kuiper wasn't done having bad luck. While on his break (with some of the world's best riders chasing), he flatted. He was given a new bike and held off his chasers to win Paris-Roubaix on his eleventh attempt. Francesco Moser (Gis Gelati) s.t. Ronan De Meyer (Boule d'Or) s.t. Patrick Versluys (Euro Shop-Splendor) s.t. Eddy Planckaert (Euro Shop-Splendor) s.t. Roger de Cnijf (Boule d'Or) s.t. Acacio Da Silva (Eurotex) s.t.